Let’s admit it. Living in Singapore can be rather stressful. Its fast-paced nature can sometimes suffocate, which explains the constant need for Singaporeans to have a getaway and escape from the hustle and bustle of the city. Two years ago, 37-year-old Adrian Chia lived at a farm stay near the Great Ocean Road in Victoria, Australia, to “recharge himself”. He described it as the “perfect getaway from the hectic digital lifestyle of a city dweller, accompanied by vast greenery and beautiful sunsets”. That very trip made him crave for more of such spaces for city dwellers to refresh their minds and bodies. He wanted to bring this same concept to Singapore and the rest of the world, so he roped in his two same-aged friends – Dave Ng and Jeff Yeo – to materialise this dream. Together, the trio pooled in $100,000 to start up Big Tiny in March 2017. 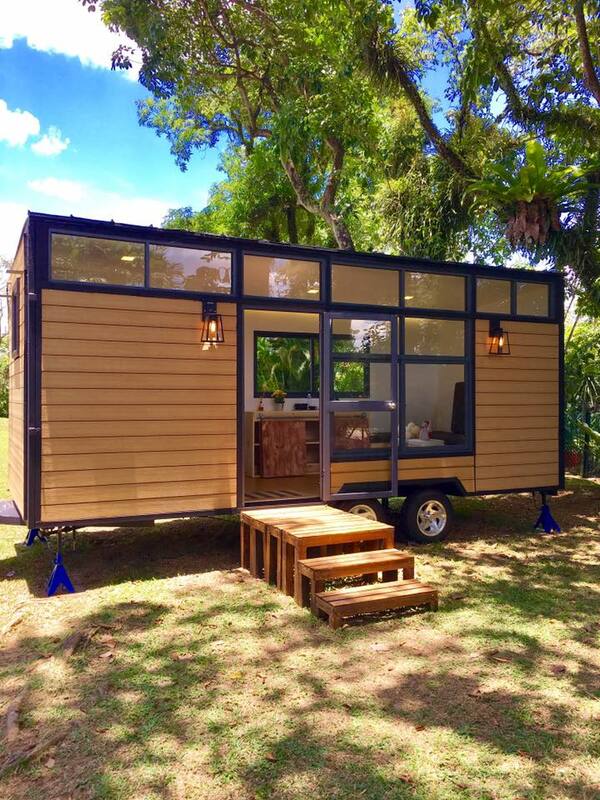 Essentially, this startup offers eco-friendly tiny house on wheels, which are available for sale to homebuyers as well as rental to tourists. 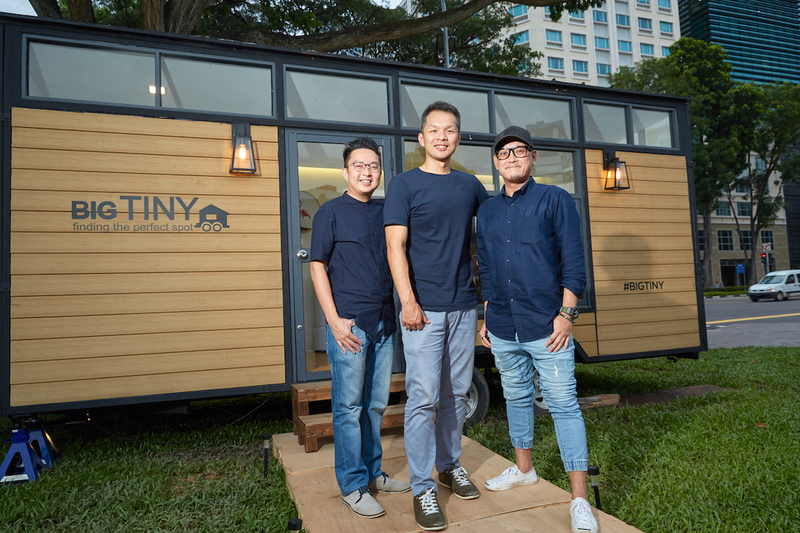 According to Adrian, Big Tiny is the first company in Singapore to integrate the concept of ‘tiny houses’ with eco-tourism. Tiny houses are part of an international trend of simplifying lives by reducing the size. This also reduces resource consumption of homes, without sacrificing the quality of life. “Currently, there are no definite measurements that qualify a tiny house. However, any residential structure under 46 square metres is generally accepted to be a tiny house,” he added. With the aim of making these tiny houses the perfect spot to recharge, Big Tiny takes the movement a step further by installing its handcrafted compact homes on wheels in scenic rural areas. The core design ethos for these houses is its smart and sustainable architecture. Each house comes with solar panels, a composting toilet, a rainwater collection system, as well as a generator that supplies electricity. Dave, who is in charge of buildings and operations in the team, personally designs the interior fittings of each Big Tiny house. Together with a student from Republic Polytechnic, they work on optimising the space and user experience. Prior to designing the house, which come in Scandinavian and country-inspired designs, Dave lived in a tiny house – the size of a regular toilet in a HDB flat – for a week. According to him, the experience made him better understand the fundamentals of designing a house even smaller than a regular studio apartment in Singapore. Currently, Big Tiny only offers two types of houses. Spanning the size of a shipping container, these homes range from 4.8 metres to 7.2 metres in length, and can accommodate up to four persons. All units come with heating and air-conditioning (which makes it liveable in all seasons), fully-equipped kitchen, shower, television, sofa bed and other functional furnishings. For instance, the beds can double as a storage space, and the tables can be folded to act as a cupboard door. “We sought to evoke the feeling of spaciousness with minimal design (floor-to-ceiling windows for maximum natural light) and used multi-functional fittings to maximise comfort in small space,” said Dave. Each house costs $80,000, and is available for rental on AirBnb and Booking.com at about $150 to $250 per night. Since the startup started sales last month, they have successfully sold 7 units of Big Tiny houses. Big Tiny partners with local landowners, such as farmers and vineyard owners, who host these tiny houses on their land. Besides allowing the houses to be parked on their land, they also play the role of hosts to the guests. The co-founders also shared that they provide training for these landowners, who will be the point of contact for the guests. At the end of the day, this partnership is a win-win for both parties. Big Tiny gets to secure a scenic, rural spot for its guests; and in turn, the landowners get to earn additional income thanks to the rental fees. Currently, Big Tiny is also working with the landowners to “curate unique activities”, such as wine tasting at a nearby vineyard or horse-riding, to further attract tourists. Recapping on Big Tiny’s journey so far, Adrian said that it has been a challenging process from idea conceptualisation, to production of houses, to actual hosting of houses on land. Most ideas do not come out fully formed. It only becomes clearer when you work on it, so you just have to get started. To date, Big Tiny has two units housed in Australia – one in New South Wales, and another in Victoria. However, these properties will only be available for rental by the first week of February, said Adrian. We are currently focusing our efforts on placing Big Tiny houses in Australia because research has shown that 500,000 out of the 8 million tourists to Australia in a year are Singaporeans. We believe this is a good market to explore. When asked if they will be making these houses available in Singapore anytime soon, Adrian said that Big Tiny houses are unlikely to be deployed in Singapore for now. “But we look forward to working with the authorities to make it happen in the near future,” he added. In an interview with The Straits Times, the co-founders mentioned that they are looking at discussing with the Urban Redevelopment Authority on the possibility of parking Big Tiny homes in local scenic spots such as East Coast Park and Marina Barrage. 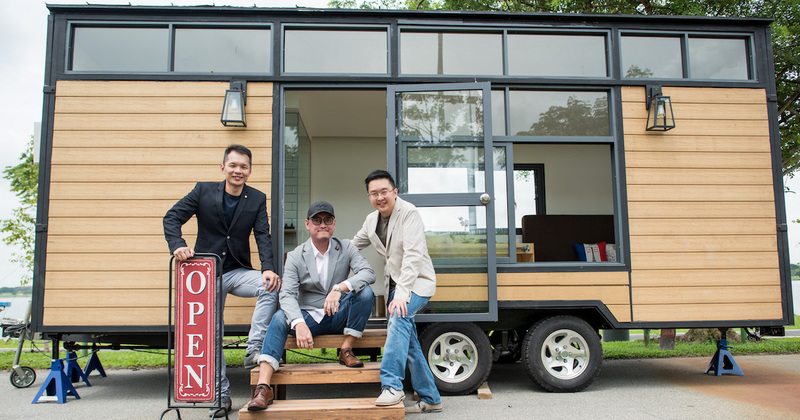 Elaborating on their business expansion plans, the co-founders revealed that they will be installing more tiny houses in Melbourne and Sydney this year. When asked to impart a piece of business advice to fellow entrepreneurs, Adrian said that one should always dare to dream because the world is full of opportunities and challenges. Opportunities always lie in challenges and complaints. If you are able to solve [this pain point], then you’ll succeed.